00:01:16  <Zuu> Wasn't there a website which had a graph over how much of the checked in source code that is written in different languages? 00:13:09  <michi_cc> Eddi|zuHause: From the MSVC project files. 00:14:23  <michi_cc> And for the C entry I guess they count .h as C and not C++. 01:22:41  <Eddi|zuHause> the third time you can get it in 7kB! 09:08:36  <lugo> tested for tropic climate only yet; is that known? 09:12:01  <peter1138> when you what? 09:15:45  <lugo> oops i accidently..
10:08:51  <peter1138> how does refitting alter the number of articulated parts? 10:08:58  <peter1138> or is it a magic trick? 10:13:02  <planetmaker> maybe the max_zoomlevel should be a config file only option to allow continued use on low-memory devices? 10:36:50  <peter1138> planetmaker, you're using the 32bpp blitter, right? 10:49:37  <andythenorth> peter1138: you *have* developer newgrf tools turned on right? 10:57:05  <peter1138> can they just be hidden? 11:07:35  <peter1138> planetmaker, have you tried to build a ship? 11:07:44  <planetmaker> no, should I? 11:10:11  <peter1138> ok, what's good for 2 fishing grounds of 45t? 11:13:31  <peter1138> everything needs "testing"
11:15:54  <TrueBrain> right, time to write OpenDoom3, who wants to help? *me whistles 10 seconds* there, done! EPIC! 13:00:30  <MNIM> it doesn't work! 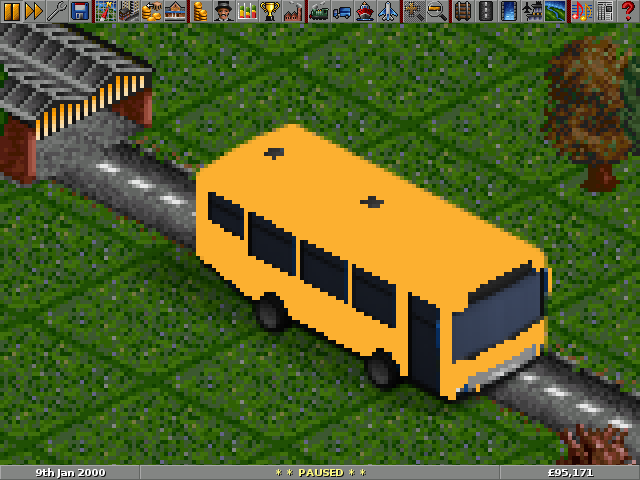 13:40:26  <CIA-6> OpenTTD: truebrain * r23296 /trunk/src/town.h: -Codechange: I found a fund building, but do I fund found buildings? 13:41:11  <Eddi|zuHause> how are you funding buildings if you haven't found them yet? 13:42:26  <Noldo> is founding buildings the process of making foundations for the buildings? 13:43:29  <Eddi|zuHause> in german we have a saying that translates to "you can't see the forest, because all the trees are in the way"
13:53:38  <Sacro> Eddi|zuHause: can't see the wood for the trees? 14:01:50  <peter1138> who wants EZ? 14:36:03  <peter1138> ah, cursor size. hmm. 14:42:45  <Eddi|zuHause> man you're glad! 14:49:59  <andythenorth> how about we try building towns and industries and crap near rivers? 15:35:51  <andythenorth> so....grfv8 should remove prop 1D trains (and equiv. other vehicle types)? Or not? 16:08:10  <peter1138> never used aqueducts. that issue is in trunk too, yes? 16:08:43  <Rubidium> peter1138: I guess it is; you didn't change the sprite sorting, did you? 16:21:46  <peter1138> makes sense for if larger sprites are used. or something. hmm. 16:33:36  <planetmaker> can I conditionally skip the parameter of a string in a translation? 16:33:53  <planetmaker> i.e. not ouput the value "1"? 16:38:26  <TrueBrain> The town grows every 1 day looks silly ..
16:42:23  <TrueBrain> don't more places have the same issue? 16:45:51  <Yexo> <Eddi|zuHause> Yexo: (NameError) "global name 'expression' is not defined". "nml/actions/action0properties.py", line 221, in ctt_list <- was that fixed by removing the ".expression" from that line? 16:48:18  <Yexo> hmm, how is strgen actually compiled? 16:49:58  <TrueBrain> planetmaker: does it work now? 16:54:54  <TrueBrain> Yexo: strgen is compiled by a checkout, I think from extra/strgen or something? 17:45:07  <Terkhen> http://paste.openttdcoop.org/show/797/ <-- I can't compile to know for sure... what does (funded) means in this context? that someone funded the creation of new buildings? 18:00:45  <Eddi|zuHause> <andythenorth> so....grfv8 should remove prop 1D trains (and equiv. other vehicle types)? Or not? <-- no, just add a note in the specs that the new props are "better"
18:10:44  <Zuu> Am I right that currently there is no interface to set town goals in OpenTTD trunk? 18:14:36  <Zuu> I'm surprised though that you already have commited that part. 18:19:53  <Zuu> It does makes sense though to get this in already if it is relevant already to reduce the size of your patch-queue. 18:38:52  <Terkhen> "I liked my subsidy window empty of mail subsidies"
18:40:29  <Xaroth> better, company-dependant subsidy offers. 19:38:51  <TrueBrain> you still havent found the other two? 19:39:28  <Eddi|zuHause> the most important easter egg seems to be "change newgrfs ingame"
19:45:15  <Eddi|zuHause> michi_cc: maybe we need a newgrf property to make the bounding box larger? 19:51:13  <frosch123> maybe that stuff is so special, that it warrants speical functionality by ottd? 19:53:28  <frosch123> Eddi|zuHause: add a console command to unpause for x ticks? 19:54:07  <Eddi|zuHause> "unpause" -> "this is only available on a network server"
19:58:11  <andythenorth> so...how much could be scripted? 19:58:19  <andythenorth> what are the practical/performance limits? 19:59:17  <Xaroth> andythenorth: more and more, but there are performance limits for now..
20:10:27  <Eddi|zuHause> Xaroth: maybe you should assign goals in small steps, the largest towns first, or so? 20:12:35  <andythenorth> what time is that? 20:27:38  <Snail_> how's it going? 20:36:52  <andythenorth> Snail_: how is the french set coming along? 20:38:03  <Eddi|zuHause> Snail_: are you using railtype labels for narrow gauge? 20:39:36  <Snail_> member:Eddi%7CzuHause: you mean the NuTracks? 20:42:13  <Eddi|zuHause> Snail_: yes, but "designed for" is not the same as "can only be used with"
20:43:00  <Snail_> so I might just add my labels to the wiki? 20:44:50  <andythenorth> Eddi|zuHause: you discussed railtypes with MB? 20:47:33  <Snail_> Eddi|ZuHause: do you have the addy of that wiki page by any chance? 20:58:13  <Snail_> Eddi|zuHause: I can send him a PM. Looks like my tracks are the first NG ones to hit the table anyway? 20:59:04  <planetmaker> hasn't pikka drawn (and released) some? 20:59:10  <planetmaker> or is that still old-style? 20:59:56  <Eddi|zuHause> hasn't pikka done "finescale" rails? i.e. standard gauge that is just drawn narrower? 21:27:13  <Zuu> In rexep (python), how can I use parenthesis in a substitution to only substitute part of the match pattern while still specifying boundary limitations? 21:27:41  <Zuu> Eg. I want to match \.AI_[A-Z0-9], but only replace "AI". 21:32:33  <Zuu> Oh, I think I got it, I need to make a group not (only) for what I want to replace, but actually, for what I want to keep. 21:34:23  <Zuu> RegExReplace is a two line function that is basically calling p = re.compile and then p.sub. 21:34:53  <SpComb> why not just re.sub? 21:35:19  <Zuu> no idea, but the docs seem to prefer compiling it manually. 21:40:51  <valhallasw> it matches word beginning /in which regex dialect/? 21:41:36  <Zuu> Depending on your vim settings you might need to put a \ infront of it. 21:42:53  <valhallasw> but you can probably use \b? 21:43:56  <Zuu> Will \b work even if there is no space in between, eg when there is a bracket? I guess so. I remember reading that it defines words as \w or \W which probably doesn't include brackets etc. 21:55:05  <Zuu> So it is basically the same as < and > except that it is not directional, but it still matches the location between two characters so you do not need to put anytihng back in the result again. 21:58:00  <Zuu> Oh, right, \b is _beginning_ of word, so it is indeed directional. 22:15:05  <Zuu> I tried to pull, but it appears that you haven't commited any changes since the last CF build. 22:18:16  <Zuu> At least that is what appears to be the squirrel call when debugger kicks in. 22:19:02  <Zuu> It causes AIConfig::GetSetting to be called. 22:19:34  <Zuu> script_controller.cpp, line 80 calls it. 22:21:12  <Zuu> The actual problem seem to be that it tries to get the AIConfig of company 66. 22:23:42  <Zuu> Indeed, the times when I've digged in that code it has been a lot of stuff to keep track of. 22:25:42  <Zuu> I have to say that I'm impressed by your work. 22:56:11  <Zuu> At least all that follow my coding style. 22:56:30  <Zuu> planetmaker: It seems noone is playing there now. 22:56:56  <Zuu> I don't know if that game is done or if anyone wants to continue it. 23:05:28  <__ln__> how do i get page numbers of table of contents vertically aligned in MS Word 2010, rather than having a kind of inverse indentation for subsection entries? 23:28:53  <Xaroth> Zuu: in your town nut, why loop to pop all neighbours over 3, instead of creating a new list and adding the first (up-to-3) from the old list? 23:42:51  <Zuu> Xaroth: it was just how I made it. Probably because it requires one list less. That said, I see that if the list is long, your method is probably faster. 23:43:54  <Zuu> In overall the implementation was not focused on execution speed, but to try things out. 23:55:08  <Zuu> Its a python script that converts my SuperLib directory from being targeted at AIs to being usable for NoGo. 23:55:58  <Eddi|zuHause> you mean a 's/AI/GOAL/g'? 23:58:07  <Zuu> But indeed, "Goal" is a bit silly if it grows out of just being about goals. 23:58:27  <Zuu> Now is the right moment to make changes while there is only a few scripts done.